Tapioca Maltodextrin is a dextrose (plant sugar) polysaccharide. A polysaccharide is a long carbohydrate strand made up of many linked monosaccharides. Tapioca Maltodextrin in particular is derived from the South American native cassava root. Other Maltodextrins can be found in things like corn or wheat, but they do not work quite in the same manner as tapioca. 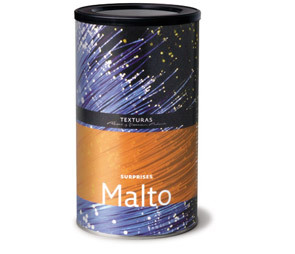 Tapioca Maltodextrin is unique in that unlike other starches, which thicken water based solutions, it thickens fat based solutions. If the Maltodextrin comes into contact with too much water it will become gooey and sticky, which is not what we are trying to achieve as our end product. So what exactly are we looking for as an end result? .....Powder! Yes you heard me correctly, we are looking to turn any substance that is high in fat into a powder. The unique structure of Tapioca Maltodextrin allows it to encapsulate the oil molecules and hold them within a powdered state until they come into contact with water, at which point the starch releases the oil molecules. 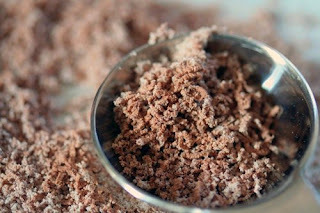 Some potential items to consider turning into powders are, but are not limited to: peanut butter, chocolate, caramel, yogurt, nutella, olive oil, etc... Tapioca Maltodextrin is a white chalky powder that has a slight sweet flavor. It can be purchased from a multitude of companies such as; Texturas, Willpowder, National Starch, or Molecule-r to name a few. Purchase sizes are usually in large quantities, but some companies do sell it in smaller sizes for at home use. Tapioca Maltodextrin is also fairly cheap on average only $10.00 for an entire pound, which lasts for an eternity if stored in a tightly sealed container. You can also buy it for an on average $6.00 for a 2 ounce pouch. My favorite recipe to utilize Tapioca Maltodextrin in is a deconstructed Reese's Peanut Butter Cup. 1.) In a large bowl place the 25 grams of peanut butter and fold in the 50 grams of Tapioca Maltodextrin until a powdery consistency forms. 2.) Pass the chunky powder through a fine mesh tamis, so that a fine peanut butter powder results. 3.) In another large bowl place the 25 grams of melted milk chocolate and fold in the 50 grams of Tapioca Maltodextrin until a powdery consistency forms. 4.) Pass the chunky powder through a fine mesh tamis, so that a fine milk chocolate powder results. 5.) Serve the two powders side by side on a spoon, so that the taster can eat it in one bite and experience the powder dissipating back into a liquid oil in their mouth.